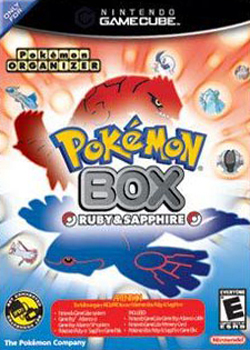 Pokémon Box: Ruby & Sapphire is a storage system for Pokémon. It can hold 1500 Pokémon. There are limitations on this, though. You have to be the OT to withdraw Pokémon, or you must have 100 Pokémon registered in your Pokedex. This is a very efficient way to trade Pokémon without possessing two GBAs. It also acts as an emulator, allowing you to play the inserted cartridge on the TV. Despite the name it is compatible with not only Pokémon Ruby and Sapphire but also Emerald, FireRed, and LeafGreen. If you connect the latter two, you cannot select 'Go to Adventure'. This page was last edited on 7 September 2015, at 05:39.